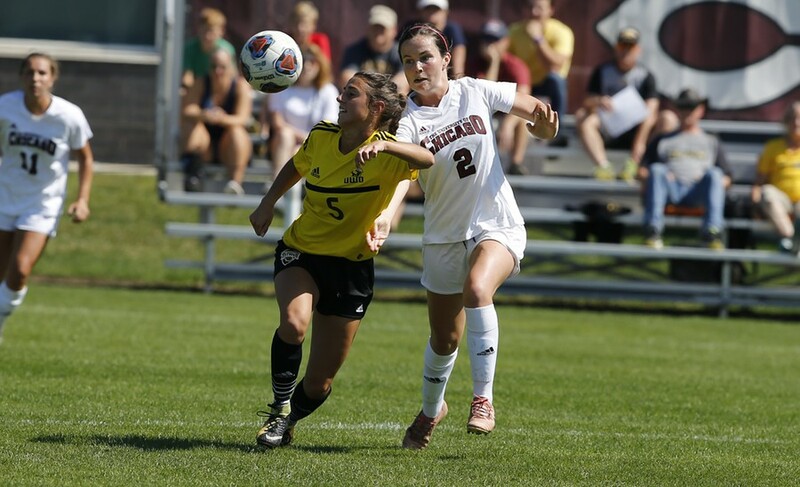 With the regular season behind them, UChicago men’s and women’s soccer teams look to make an impact in the NCAA tournament this upcoming weekend. The women start the action off in Kentucky, competing against Grove City in a first-round matchup on Saturday, November 10. The men host the first and second rounds of a three-team regional. They received a first-round bye and will play on Sunday, November 11, as they wait for the result between Carleton College and Transylvania University. The men’s soccer team (15–2–1) claimed their fourth UAA title in five seasons. Whoever their opponent ends up being, the Maroons are up for the challenge. They have outscored their opponents by a 42–12 margin. The duo of fourth-years, Matthew Koh and Max Lopez, combined for a total of 27 goals this season. Offensively, they’ve been able to create more opportunities for shots on goal. The only thing they should worry about is the fouls they give. The Maroons led their opponents in fouls committed by a 230–196 margin. This proved fatal when a foul granted Case Western Reserve a penalty in the final moments of the game and cost them the match. In pivotal moments, they must be smart and precise in stopping their opponents. Having suffered three defeats in the beginning of the season, Grove City College women’s team (16–3–1) went on a 13-game winning streak. While their final match of the season was a draw, the Wolverines claimed their first Presidents’ Athletic Conference title in 17 years after defeating their rivals in a penalty shootout. For the majority of season, the Wolverines made a habit of shutting out their opponents and not conceding any goals, much like the Maroons did last season. As a result, the Wolverines outscored their opponents by a 54–15 margin. Their attack is led by first-year midfielder Maggie Williams, who has accumulated 12 goals over the course of the season, followed by two teammates who both have 10 goals. While 8–0 in their conference, Grove City needs to tread carefully when it comes to the Maroons. Not only have the Maroons outscored their opponents by a 49–17 margin, but they are deadly throughout the entire game, with 19 goals made in the first half, and 30 in the second half. While their opponents beat them in saves made by a 60–157 margin, this is because the majority of the time the Maroons are on the attack. The pressure that the Maroons apply does not give other teams an opportunity to move the ball forward or to possess it for very long. Defensively, they neutralize threats before they become lethal. Prior to their three-game losing streak, the Maroons went eight games undefeated and were on a six-game winning streak toward the second half of the season. This can be attributed to a team where multiple players contribute to the scoring. Fourth-year Jenna McKinney leads the team with 10 goals, followed by third-year Hanna Watkins with nine goals. While second-year Katie Jasminski only has one goal this season, she has been proactive in contributions, leading the team with five assists. Despite the struggles towards the end of the season, the Maroons look to take a step forward in their goal of making it to the Final Four once again. As a part of the four-team regional, if the women’s soccer team comes out of their first match victorious, they will square off against the winner of Centre College and College of Wooster on Sunday, November 11, at 1 p.m. (ET) for the regional championship.